The boys had a decidedly different outlook. Wails of despair about the tofu. Shrugs but not a groan about the curry. I think it was the toasted cashews on top that saved me on that one. After two weeks of rich (in more ways than one) holiday meals, it was nice to get back to basics. Fresh vegetables cooked in a flash in the pressure cooker. 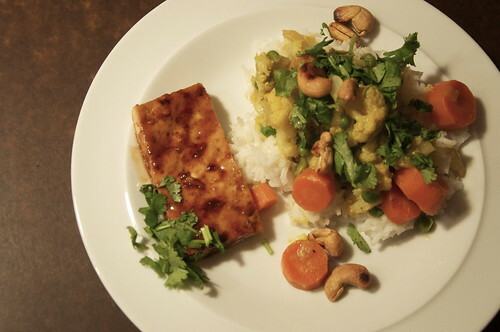 The simplicity of tofu glazed with teriyaki sauce and grilled on the stovetop. Just the right menu to kick off the week and hit the spot before heading off to yoga. 2 Responses to "A quiet return to “normal” food in the New Year"
I’ll follow you anywhere, but are you sure about the title? Dishes Men Like and Boys Will Grow Into? I know – call me delusional but hopeful. I heard somewhere that kids need to eat a food 13 times before they’ll acquire a taste for it. I’ve lost count in the tofu effort.